I loved @autumnkern & @laurenwasher’s thoughts recently on doing life in community, with friends who are walking with you and know the real you, not the one online. If you haven’t read those posts, go find them. Beautiful and true. But what if you are like me, starting all over finding community? What if you are grieving the loss of your last precious community? What if church life looks very different than it did before? No small groups or Bible studies in place? What if people around you speak a language you can only speak very brokenly? What if most of the people you know are moving away soon? I cried yesterday listening to the last Out of the Ordinary podcast episode on Friendship Hacks (so so good – give it a listen!!). The topic of friendship & community is so raw for me these days. It is full of grief & longing; perplexity & questions. This new season is so counterintuitive for us because we have never crossed the bridge of language with a family before. Grieve with Christ. As often as you need to, go to Him with your heart in pieces and full of longing. Pray. Ask for friends. Ask the Lord that out of the friendship He has with you, you would be a friend to others. Receive His grace to welcome others before others welcome you. Initiate, initiate, initiate. Send a text, invite someone over, invite yourself over, bake cupcakes – take them to your neighbor. Ask how you can pray. Make a meal for a family. Invite someone to pray together. Invite friends to the movies with you and your kids. Don’t get discouraged if none of them can make it. Be patient. It might take time before the seeds of friendship bloom…but just because you can’t see it, it doesn’t mean they are not growing. Be transparent with others. Share what God is teaching you. I am sowing seeds of community, fiercely hoping in the Triune God who is a community and who creates community. I am praying against the cynicism that seems near – the one that thinks this isolation is how it will always be. That knowing and be known just won’t happen here. I look at Christ’s relentlessness in pursuing His friends, even when they fell asleep, and left Him in his hardest moment. He wasn’t ruled by cynicism. His hope for them in God was firm. He loved them till the end. He gave His life to create true, lasting community. His blood has welcomed me to the community of the Trinity. But we will never find out if we give up loving others and welcoming them as Christ has welcomed us. Well, hello, blog old friend! Except for two recent blog posts recently, it’s been a long time since I last wrote here, and I have missed you! The last two years were a blur for me. 2017 and 2018 felt like one long year with lots of changes and transitions. In 2017 I was pregnant with Wes- our youngest- had lots and lots of morning sickness, was part of a team that planted a church, completed a language intensive, Wes was born, and Maia started school. In 2018 we said goodbye to the UAE, were in transition, started a very restricted healing diet, moved to another country and went through major culture shock. Both years were one difficult marathon. We experienced everything from my crazy hormones and a chronic debilitating infection in my husband to post partum darkness for me & autoimmune symptoms for both of us. There wasn’t much reprieve between our stressful time of transition in the US and our move to this country. We did all that with three kids in tow, including a baby who slept maaaybe 5 full nights his whole first year of life. We are still in this season of resettling. During this time I’ve also found myself cooking for 3 different diets for health reasons. I’ve been spending 4-6 hours in the kitchen making 6-9 meals every day. It’s been brutal. Sometimes people look back on a time of suffering and talk about how sweet it was and how they knew God so much better through it. If I’m honest, sweet is not how I would describe these past years. There was a lot of joy at different times. God met me in His word and fed my hope time and time again. But these have been hard years with many days barely making it from one day to the next. I have wrestled with Christ. There have been all kinds of tears: tears of exhaustion, of anger, of perplexity. I have at times resisted the mighty hand of God that causes sleepless nights, illness, and all kinds of stress because I have been afraid it will break me. Having little reprieve in unrelenting stress with increasing demands has been fuel for lots of temptation. I have been especially tempted to doubt God’s goodness and care for me, and to put my hope in something other than God, namely, REST. How do I process a very difficult, long season? Especially when my faith has been tested and I have a hard time seeing if I have really grown in trust? Do I give in to serious introspection? Do I despair over the many times I gave in to unbelief? Do I find comfort in the times I did trust? How do I move on with confidence to a different season of resettling and language learning while still experiencing some of the same suffering and temptations to unbelief? In some ways I don’t think it really matters whether I see clearly what all God has been doing, and whether I can clearly measure growth in knowing God. What gives me confidence is what Christ did when He bound His life to mine (Rom. 8: 9). He, the Uncreated One, came to live inside me through His spirit. He also hid me inside himself forever (Col. 3: 3). Nothing can change this. I am inside Christ. Everything that the Lord has brought to my life and that He will bring in the future, I can only experience safely in Him. I wrote earlier that I have feared at times that all this stress would be the end of me. But that can never be. Nothing can destroy me. I am hidden in Him in an irreversible way. God is for me in Christ. Safe in Him, what can man [or sleeplessness, unrelenting stress, exhaustion, or depression] do to me?” (Psalm 56: 8). Moreover, in Christ the only thing they can do is serve Him His purpose to do me good. God never wastes anything so whether or not I can see what He has been accomplishing in my life, I take heart: He will effectively fulfill His design in conforming me to His Son (Rom. 8: 29). Christ is inside me. I don’t need to be overly preoccupied with my faith, because “I no longer live, but Christ lives in me” (Gal. 2: 20). I live by faith in His faith, not mine. Because He is faithful and true, I have seen Christ’s faith in His Father ultimately ruling my heart, enabling me to submit to His word, and praising Him when I don’t understand what He is doing or why. Christ’s holiness in me has been enabling me to confess when I trust my judgement more than His. In a shocking gift of grace, God is living His life through me in Jesus Christ (Eph. 4: 18). That is the only way to overcome the unbelief in my heart that Christ already overcame at the cross. The life of Jesus in me is revealed through suffering. This diet, this culture shock, this broken body of mine are how God will manifest the life of Jesus in my mortal flesh. This moves me to embrace this season. To thank Him for it, even. I will only know His endurance, His trust, His courage, and His joy as I see Him living them out in me by faith. His life is the life I want, the only life that enables me not to lose heart (2 Cor. 4). No, but really. Going through change with young kids, especially cross culturally, IS hard. The constant demands of caring for them paired with culture shock makes for a great deal of stress. We have done this whole gig without kids and it’s another story entirely (though admittedly, with it’s own set of hard). When you transition with family, you bring your own little home with you. Even when your new house doesn’t feel like home, and you still don’t have “safe” friends that you can be yourself with, you have your husband and children with you – the people that know & love you best. Children help you live life in community. They introduce you to new friends through their friends at school or in the neighborhood. Having kids forces you out of isolation – their need to burn energy takes you to the park; their need for friends helps you remember you need friends too; and, their cuteness breaks down walls & ice with neighbors. You get to experience the new city or country twice – through your eyes and theirs. Having kids pushes you to keep doing hard things necessary to create a life in your new community when maybe you’d take a break. For example, my girls really enjoy going to church. Even though I love worshipping God with His people, sometimes going to church is hard work for me in this season, because of significant language barrier. There have been times I am tempted to stay home. Knowing how much they want to be there is a sweet encouragement to me. The discipline of showing up Sunday after Sunday to a worship service in a foreign language is yielding fruits in my heart. There is a knowing & being known happening that in turn deepens love for God’s people in this place. This gives Him glory. I will write more about this soon. God uses my kids to build up my faith. He uses their endurance to grow my own. Their courage in the face of hard things is life- giving to me. Christ really knows what he is doing with them. Having little people’s needs to care for ahead of my own is God’s mercy to me. Their vulnerability and neediness drives me to the end of myself very quickly. When life gets hard, and I want to seek strength by myself, Christ draws me to Himself as the one who alone is my strength. Finally, kids – they keep you laughing. And man, the Lord knows how much we have needed laughter in the middle of all the crazy. Christ’s faith in us gives us eyes to see God really is kind in all his ways. His wisdom planned this transition & language learning season with kids. It is challenging and yet also His good gift. I look forward to getting more perspective into all He is doing in us during this time. And yet the trustworthiness of God assures me of this: goodness & mercy will follow us as a family every single day of our lives. I’d love to hear from you. What are some ways you see God’s gift to you in your kids during challenging times? Have you ever thought, “I’m not a typical woman?” I have. I remember many years ago, not “getting” what was so great about being a woman. Somehow my idea of womanhood was tied to doing things with my hands like baking and crafts. But I didn’t think I was good at those things. I was more drawn to “heady” things (nerdy things you might say) like theology and philosophy. I thought men’s conversations were “typically” more stimulating. The Lord was very gracious to me and through a process that involved the gospel, faithful mentoring, and rich redemptive-historical theology, I embraced God’s design for womanhood. I didn’t embrace womanhood as a gospel, as the good news. But the more I fell in love with Christ and His gospel, I was glad the Lord had made me a woman. His purpose for womanhood was to tell the world something about Himself that men alone could’t do. I was a woman by Him and for Him. Over the years, the Lord has continued to sharpen my theology on womanhood. More recently, Abigail Dodd’s book, (A)Typical Woman was helpful in that process. I appreciate many things about it but what sets this book apart is Abigail’s emphasis on the fact that Christian women are women who are one with Christ. She fleshes out the significance of this reality and its implications for every woman. This is a message that the Church sorely needs. We need to know what it means and why it matters that we are women who have truly died and are entirely new in Christ Jesus. You may have read many books on Christian womanhood but I think this book will still challenge you. It will spark rich conversation that our churches need. Chapters are relatively short and each chapter ends with discussion questions. Maybe you can grab a friend or two use and use those discussion questions to explore the topics found there. While this book is a very comprehensive view on womanhood, it is not exhaustive. I wish Abigail had had space to develop some ideas more fully. She doesn’t engage too much with possible positions or interpretations of passages that differ from her perspective. She is gracefully bold and in some ways counter cultural (maybe even within the church). I am thankful for her faith. Friend, I think you will sense that these words were penned by a woman who delights deeply in Christ and it will make you long to know Him like she does. Her delight will overflow in making your own heart glad in Christ. It did for me. It led me to worship Him and to glory in who He is. It renewed my joy that I exist as a woman for Him. I praise you, infinite Christ, that I am in you and you in me. What a mystery…what a glorious hope! Go get the book and read the whole thing! It will make you want to be an atypical woman for all the right reasons. We are leaving the UAE in 3 days. For almost 3 years, this country has been our home. Father brought us here, brought me here, to continue remaking me after Christ. He has used so much – people, conversations, trials, disappointment, joy, temptation, the birth of our son – to reveal my heart, to feed my hope on the Resurrection, to delight in being one with Jesus… to give me more of Christ. Something this week made me want to look back on the songs that God used at key points to minister to me these past 3 years. Re-listening to them this morning brought back such strong memories of specific moments in this journey. Through them I can see where I was on the journey at different times: excited and hopeful, weary and broken, rested and comforted, tempted and failing, steadfast and full of faith. They remind me what I needed from the Lord and how He was so faithful to comfort, encourage and strengthen my faith every step of the way. I tend to listen to songs over and over again. These are my most-listened songs during our time in the UAE. I thought it’d be fun to collect them all in one place. Today we are starting to sell/get rid of all our things, getting ready for our move next month. So yesterday, we went around the house saying goodbye to the things we love. At first it seemed like a funny thing we were doing. The girls were very amused by the exercise. But then, we got to their bikes. Our four year old melted in my arms, completely devastated. “I can’t keep my bike? !” Her voice broke down. “But I LOVE my bike! It’s my birthday bike. I really wish I could bring it on the airplane….” All this between sobs. It was one of the hardest moments we have had as parents. We knew it would be hard. Ethan and I had already pre-grieved this loss earlier this week. But seeing her walk through it was heart-breaking. We sobbed with her. It’s funny how God knows the ways I need to grow up as a mom. I have been dreading these last moments here in this city. I wish I could keep my kids from hurting, but if I did, I wouldn’t see this: their child – like trust in God or the beautiful picture of a Father that embraces us and hold us in our grief. My girls are tasting the comfort of the Father. I am seeing Jesus living His life in me, giving me His own child-like trust to entrust our family to my Papa in Heaven. Our whole family is learning to live inside the much bigger Story we are part of. After all, He is worthy. I have never liked January (if this is your birthday month, sorry! ), and I am not sure exactly why. I don’t like January probably in the same way I don’t like Mondays and that I am not a morning person. And probably why I love Thursdays and my favorite time of day is dusk. To me January feels like dipping my feet in the ocean, testing out the temperature to see if I want to get in. But unlike deciding whether I want to get in or not, I can’t really decide whether I get into the New Year. And so I usually just “get into” it, dreading that I have no choice but go in. Maybe it is just another way that perfectionism has trickled into my life. I would much rather finish something than start it. This dislike may also be another way of looking inward – of figuring out whether I have what it takes to do something and do it well. This year, especially this first quarter, feels more like an ending than a new beginning. We are moving from this country in May, which means we have about 4 months left here. We need to plan our move to another country, as well as our summer back in the US. We long to care for our family and love others well as we do this. We are exhausted (“Aylín is barely making it” my husband wrote to a friend this week) ‘cause baby. ‘Cause sickness. ‘Cause post partum hormones. ‘Cause church planting. ‘Cause we have 3 littles. ‘Cause we have been culture-shocking and in transition for about 2.5 years and about to go through another round of it. If I look inward I already know I don’t have what it takes to get into this year. But still the year begins. We have change ahead with lots of unknowns. And lots of goodbyes. Then transition to new beginnings and a new way of life. Fresh start is not exactly what comes to mind when I think about January. Fresh strength, however, does come to mind because it is what we need, not what we have. In desperately obsessing about my need for rest and fresh strength earlier this week the Lord took me to Isaiah 40: 31: “Those who wait for the Lord shall renew their strength.” I had read this verse before. But this time it took me by surprise: that the way to fresh strength is waiting? I personally want to do something about it. “Where can we go to rest? What plans do we need to make it happen?” That’s what I kept wondering this week. Waiting can also be draining. And yet the Lord calls the one who is fainting and weary to wait. Wait for Him. Reading the whole chapter helped me to understand the logic of God in that verse. Isaiah 40 is God’s comfort to His people who are in exile. He comforts them by setting their gaze and their hope in their God and in the cosmic display of His glory. The Lord would come as a mighty King, a generous Rewarder and as a gentle Shepherd. All flesh would see Him. He can’t be compared to anything they could think of. His power, His understanding, His wisdom are unsearchable. They might feel as if God had forgotten them, could not see them. But Isaiah reassured them their way was not hidden from their God. He is the everlasting God, He created even the ends of the earth, hidden to everyone but Him. He had all the power to deliver them because He doesn’t faint or grow weary. He is completely trustworthy. He shows up at just the right time. He is an endurance-producing God. The way to fresh strength is waiting for this God. From this side of the Cross, I know that the cosmic display of the glory of the Lord was revealed at the Cross, when Christ, the Servant of the Lord was lifted up. The Mighty King used His might to die and to atone for our sins; the Rewarder received God’s punishment in our place. The Gentle Shepherd became the Lamb of God, silent before its shearers. And praise God, his death was not the end of His life. He saw the offspring He fathered through his death. His days were prolonged (Isaiah 53: 10). He rose to everlasting life. Christian courage is active faith in the strength of Another. While perfectionism would have me look inward for strength (leading me to feel faint), the Lord has me find strength by beholding the Lamb of God. I see Him seated at the right hand of God, governing History (including my little life) with all authority to accomplish His purposes. He is there, praying for me. He will never grow weary of completing the good work He started in me and in the world. 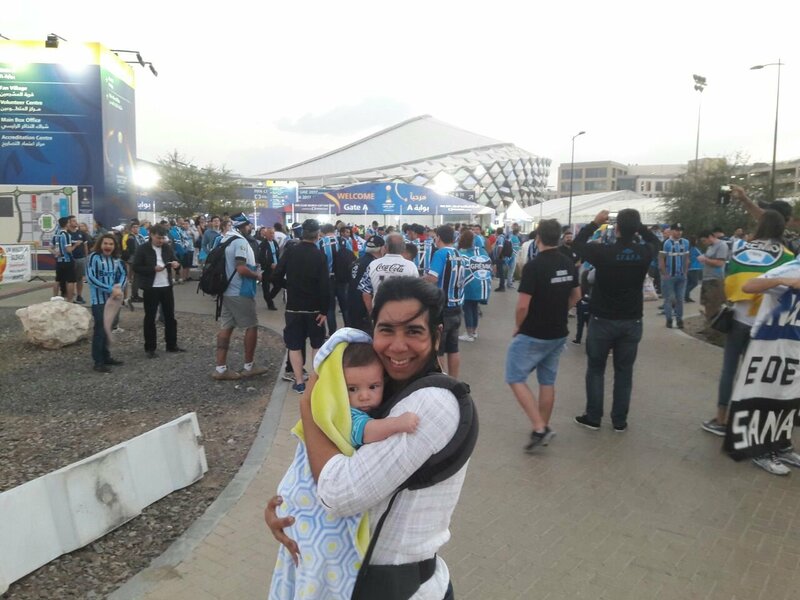 A few weeks ago, my husband and I went to a FIFA Club World Cup match here in our city. The teams, Mexico against Brazil, were competing for second place. The stadium was vibrant as the fans cheered the players on, especially awesome loud Brazilians with their drums and chants. (It was the closest I have felt to my country and the most alive I have felt in a very long time). I was struck by how invested they were in every play. Their energy was contagious. The players were on the field and the spectators were at the edge of their seats, excitedly watching their every move. It occurred to me that this is how the witnesses of Hebrews 12 must be. It is for this tireless, victorious, promise-keeping God that I wait. So it is another day and I only slept 3 hours…again! I wait for the Lord. We have weighty decisions ahead of us and we are not sure what is best for our family. We wait for the Lord. My nursing baby is still feeding multiple times every night which means sleep is short. Interrupted. I wait for the Lord. We have lots of things to do before we move internationally in 4 months. We wait for the Lord. My kids are sick. Weren’t they just sick? I wait for the Lord. I am going through transition feeling weak and vulnerable in more than one way. I wait for the Lord. We look ahead to the year and we don’t know how we will make it through. We wait for the Lord. Will we even see the fruit of all this effort and uprooting? We wait for the Lord. I am not dipping my toes into this year. My Strength is coming and carrying me into it. And that is infinitely better. What are you waiting on God for? In what specific ways does His worth encourage your heart?